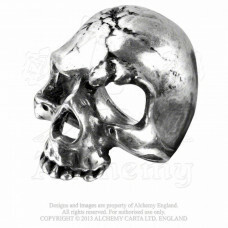 We're currently trading at the Whitby Goth Weekend! This means orders will not be processed until 18/04/19. Visit our facebook page for more info! A ram-horned guardian of the gates of the abyss, to meet those chosen to descend from Purgatory. 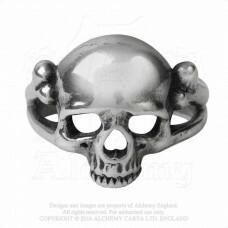 A large pewter skull ring with ram's horns. Fastening & Packaging Packaged in an Alchemy branded bag, including Alchemy Guarantee and care instructions. Three deaths for the auspicious and those leading a dangerous existence, each caput mortem, or death.. 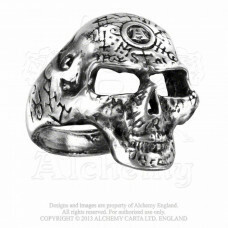 This ring provides the most direct statement of attitude with the famous blank, stark expression of ..
A true symbol of strength, wisdom and achievement; a portrayal of The Alchemist, with the impossible.. 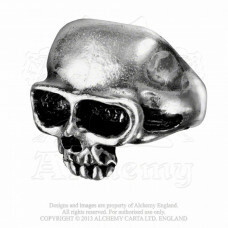 The skull of the fount of all wisdom, The Alchemist, wearing his total, all-powerful esoteric knowle.. In memory of death, as our forebears so readily observed, in the face of God or in the sanctuary of ..
Defiance on the face of death, never to concede defeat. 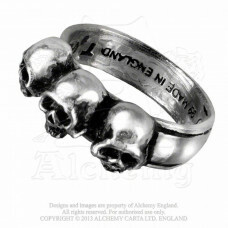 A macabre ring made for the dark ages. A l.. 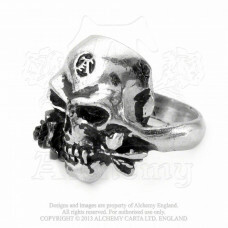 Commanding power in the Underworld and communicating with the dead, using the secrets of demonology ..